Devon Jeffreys of Football Insiders joined me Saturday to talk about recent stories he’s written about Dallas Cowboys linebacker Rolando McClain, Rex Ryan taking over the Buffalo Bills, and Chip Kelly’s offseason gambles with the Philadelphia Eagles. Jeffreys also talked about what’s stood out to him as of late in regard to how close National Football League teams from the state of Florida are to making a return to the postseason. A wild start to free agency this week has a number of players in the National Football League relocating to new parts of the country. Among the surprising moves was one made by Dallas Cowboys running back DeMarco Murray, who opted for more money by joining the rival Philadelphia Eagles. On Saturday we discussed the decision by Murray and broke down the moves being made this week by the local NFL teams in the state of Florida. The only running back worth a first round pick in the 1990 NFL Draft turned out to be Emmitt Smith. At No. 17 overall. Despite being the second selection in the draft out of Penn State, by the New York Jets, Blair Thomas was outdone in the National Football League by nearly every contemporary picked after him. His pedestrian 2,236 yards rushing and seven touchdowns (533 carries) over six years trails a number of other moderately memorable guys, even some worth remembering. Terry Allen was taken by Minnesota in the 9th round before going on to rush for 8,614 yards and 73 TDs. Chris Warren, selected in the 4th round by Seattle, rushed for 7,696 yards and 52 TDs. Maybe Thomas would’ve been better off with a different team. He entered the league at the same time as New York’s first-year head coach Bruce Coslet, who would last just as long with the Jets as Thomas did before going on to finish his NFL career with a worthless 47-77 record over nine years. It’s worth mentioning that Coslet never knew a season better than 8-8 while on the sideline with either the Jets or Cincinnati Bengals. 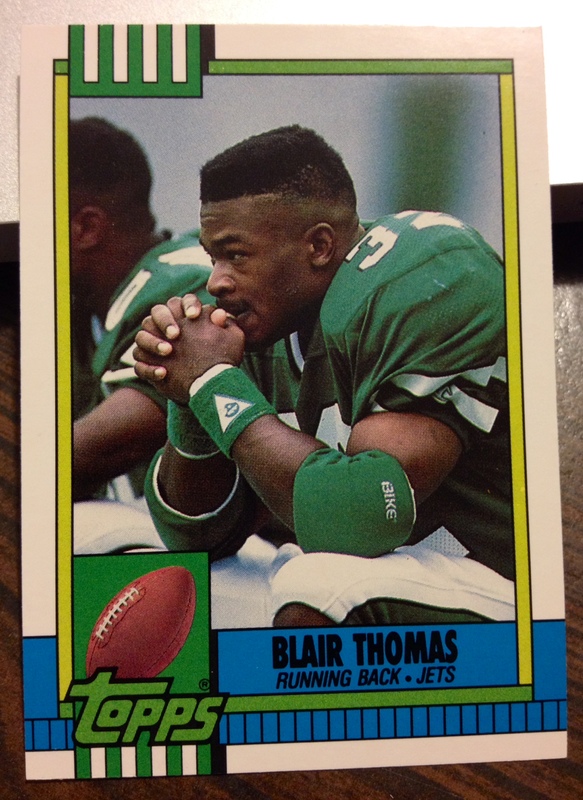 Thomas rushed for just 2,009 yards (468 carries) and five touchdowns for the Jets from 1990-93. He carried the ball at least 15 times in a game only eight times during that stretch and rushed for 100 yards or more just two times. Career highlights include 20 carries for 100 yards in a loss to the New England Patriots in his fourth career game, and then going for a career-high 125 yards on 27 carries against the Chicago Bears just four games into his second season. On Saturday we touched on a few touchy topics in the National Football League including Michael Sam joining the Dallas Cowboys, Tim Tebow and his religious views, and the league’s drug policy when dealing with players and marijuana. We continued the marijuana and NFL drug policy discussion in the next segment. We also previewed Sunday’s games involving the Jacksonville Jaguars, Miami Dolphins and Tampa Bay Buccaneers while discussing fantasy football options this week and the love/hate relationship between pro football fans and Cowboys quarterback Tony Romo.